As many of our customers already know, we are strong believers in the benefits of driver training for owners of lightweight sportscars. With a multitude of options available it can be difficult to choose just what is right for you, your car and your budget. 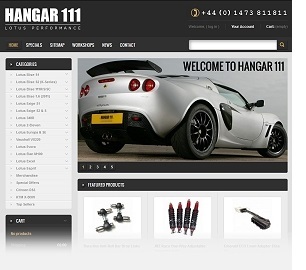 Hangar 111′s Driver ‘Tuning’ days are intended to provide our customers with the necessary tools that will give them the confidence and knowledge to get the very best from their cars and the modifications we have made to them. We have worked with a number of professional coaches including: Andrew Bentley, Scott Mansell, Jack Goff, and Nigel Greensall. Together we can provide a full day of 1-2-1 coaching combined with data logging, and track-side car setup. This approach allows us to tailor the car setup to the needs of the driver as they develop their skills on the track. Where we have setup a car prior to the day itself, we will have you up and running quickly at the circuit so you can make the most of the finer-tuning aspects which we will carry out in-between each session on the track. A Driver Tuning day with us is a completely comprehensive driver improvement programme that is suitable for road, track and race drivers and their cars. The aims of the day can be tweaked to incorporate any specific areas you may like to address. Our aim is to give you the ability to drive your car faster, more accurately and with the confidence that you will only truly achieve with a correctly setup car that you are fully dialled into. Driver Tuning Days are available to anyone looking to get in touch with their skills and their cars potential and can take place at any UK motor racing circuit. Dates are by appointment only and can be shared by a maximum of 2 drivers in one or two cars. Please contact us for more details.